It must be remembered that the initial invasion of Ireland by the Cambro-Norman lords was not an invasion but an invitation by a deposed Irish king to foreign mercenaries to help him regain his title. These Cambro-Norman mercenaries fought alongside their Irish host as part of an inter-necine battle for supremacy. It was not until Henry II invaded in 1171 that an invasion by foreign occupying forces took place and this resulted in only a partial occupation insofar the Irish kings outside of Leinster – realising they would be quickly defeated – agreed to the terms of the Treaty of Windsor which allowed them to keep their titles but also allowed Henry II to ‘plant’ of a few of his most trusted barons via land grants. Later, as these barons gained more land (by conquest) and power (by marriage), Henry began to seek subtle changes to the Treaty of Windsor in order to control them. One such change was at the Council of Oxford in 1177, when it was agreed that Prince John would be made King of Ireland. This would appear to have been a strategy of Henry II to divide his Angevin possessions between his four sons. The approval of Pope Alexander III was sought to have John crowned King of Ireland. As a result of this delay, John went as only Lord of Ireland. In 1184 arrangements were made for John’s departure with the sending of John Comyn and Philip of Worcester to prepare the ground for John’s arrival. These two men were interesting choices insofar as they answered to both the English King and the Pope – as such, their respective agenda, actions, and motives were somewhat mixed. He was chaplain to King Henry II of England and upon his “urgent” recommendation was elected Archbishop of Dublin following the death of St. Laurence O’Toole in 1180. He had been a Benedictine monk at the Evesham Abbey and in 1181, he was elected to the archbishopric of Dublin by some of the clergy of Dublin, who had assembled at Evesham for the purpose. He was not then a priest, but was subsequently, in the same year, ordained such, at Velletri, and on Palm Sunday (21 March) was there consecrated archbishop by Pope Lucius III. The following year Pope Lucius III granted him manors and lands in and around Dublin, which subsequently formed the Manor of St. Sepulchre, which remained under the authority of the Archbishop of Dublin until the 19th century. The pope also, in an effort to protect the Dublin archbishopric from claims by Canterbury, extended certain privileges to Comyn, which intensified the rivalry between the sees of Dublin and Armagh for the Primacy of Ireland. Despite being recognised as Archbishop of Dublin by both pope and king, Comyn waited three years before visiting Ireland – when he was sent there by King Henry to prepare the reception of his son, Prince John. The king also granted him lands and privileges which made him a Lord of Parliament. John arrived in Ireland in April 1185, landing at Waterford with around 300 knights and numerous foot soldiers and archers. After his arrival in Ireland John granted Comyn the Bishopric of Glendalough, with all its appurtenances in lands, manors, churches, tithes, fisheries and liberties, although Comyn never had an opportunity to take this up in his lifetime. Under Pope Urban III carried out a number of reforms of the Irish church to bring it into line with the church in England and in continental Europe. As such, Comyn served three masters! Archbishop Comyn would go on to serve King Richard and King John during their reigns but the relationship between the Church and the throne was an uneasy one – with both the King of England and the Pope seeing their feudal lands as sources of money and men which allowed them to prosecute their constant wars of conquest. The various kings of England were constantly at war in France while the various popes warred with everyone around them in Italy and further afield in their crusades against the Islamic rulers of the Levant. Not a lot is known about Philip of Worcester but, in his early years, Henry II lived alongside Roger of Worcester for about a year. This household was known for its education and learning. In addition, Prince John is known to have had a keen interest in the life of St Wulfstan of Worcester and, upon his death, was buried there. As such, it is likely that Philip was Henry II’s man who was there to look after the young prince and put the agenda of the pope second. The 18 year old Prince John was accompanied by Giraldus Cambrensis as tutor and secretary, and was attended by a numerous retinue, comprising many ecclesiastics, 300 knights, and a large body of cavalry, archers, and men-at-arms, all in sixty ships. They sailed from Milford to Waterford and, according to the chroniclers, several of the chiefs who came to pay their respects to him on his arrival were insulted by the youths of his suite, who ‘mocked and pulled’ their long beards, which must have appeared ridiculous to the closely-shaven Anglo-Normans. Gerald of Wales said that the Irish then complained to their overlords — men such as Rory O’Connor — of how John was “an ill-mannered child… from whom no good could be hoped”. The native princes were further incensed by lands which they believed Henry II. had secured to them in the Treaty of Windsor, being seized and given to John’s followers, e,g, Theobald Walter, William de Burgh, Gilbert Pipard and Bertram de Verdun as well as other minor land grants to lesser figures. Meanwhile, John devoted himself to luxurious enjoyment, and squandered among his associates the revenues of the towns which should have been applied to the defence of the colony and the payment of the soldiery. In a series of unsuccessful engagements with the Irish he lost almost his entire army, including some of his most valiant knights, and several of the newly erected castles were sacked by the native princes. Part of these troubles were due to intrigues by Hugh de Lacy, who was incensed at having been superseded in the viceroyalty. De Lacy was a leading figure in Henry II’s invasion of Ireland in 1171 and, as his most trusted knight, was left in charge when Henry II left. De Lacy served three times as Lord Deputy of Ireland and did much to break the power of the native Irish High Kings and enhance Anglo-Norman influence. John left Ireland in December 1185 and returned to England. Scholars largely agree that this was most likely to do with the presence of Hugh de Lacy but it is also likely that John ran out of money. It has been suggested that his departure was a setback in much broader plan to set up administrative structures in Ireland in order to control the unruly Barons via loyal, royalist forces such as Walter, De Burgh and De Verdon and that when De Lacy began to threaten his position, Prince John and his entourage escaped back to the relative safety of England. What is generally perceived, both contemporarily and in modern scholarship as a feckless attitude has given him a bad reputation and caused his first expedition to be viewed harshly. Upon his departure, John’s father (Henry II) granted the office of justiciar to the Baron John de Courcy, who had massive influence in Ulster. In 1186 Hugh De Lacy was assassinated by an Irishman and plans were made to send John back to Ireland. John did not return to Ireland until his second expedition in 1210. Image taken from Topographia Hibernica (written by Giraldus Cambrensis, otherwise known as Gerald of Wales) and originally published/produced in England [Lincoln]; circa 1220. Held and digitised by the British Library. In this scene, an Irish kingship ritual – a white mare is sacrificed, a stew is prepared and, after the Irish king bathes in it, his supporters then eat the stew. In summary, John went to Ireland to assume the lordship of Ireland in person, but retreated after a nine-month period, having failed to assert control over the English settlers there, and having suffered a series of military defeats at the hands of Irish kings. His expedition was a disaster. 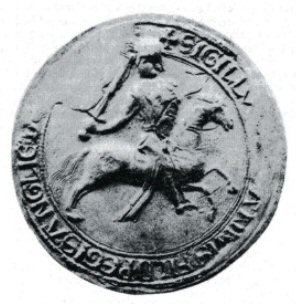 From a numismatic perspective, the time between John being declared Lord of Ireland (1177) and his 2nd second expedition (1210) marks the beginning of the Anglo-Norman coinages and what might have been an independent Norman kingdom of Ireland. His disastrous first expedition to Ireland may have directly led to John de Courcy issuing his own coins – something usually only done by a king ! Most of these coins are easily obtainable at auction or in dealers’ inventories, so they are a great entry point into collecting Irish medieval coins. They reflect the complicated nature of kingship, conquest, feudal politics and the medieval history of Ireland and how continental European influences (by the Church) were as much at play as Anglo-French struggles at the time. It also marks the beginning of the very uneasy relationship of the so-called Old English (those born in Ireland) and New English (recently arrived from England) settlers. The differences in their style of ‘administration’ is the main reason why the English really only ruled within the Pale of Dublin for hundreds of years without ever fully conquering or settling the rest of Ireland. In fact, it was not until the Cromwellian invasion and subsequent land confiscations that Ireland was ever fully under the control of the English and even then, it could be argued that Connacht did not fall completely. In this instance, we see John Comyn build a second cathedral outside of the walls of Dublin so he could avoid interference of the Mayor of Dublin and its citizens. We see a ecclesiastical battle for supremacy between St Patrick’s and Christchurch, between Dublin and Armagh, and between Rome and Canterbury when John Comyn becomes Archbishop of Dublin … and he arrived with the young Prince John in 1185. ← O’Brien Rare Coin Review: Will the Irish 1c and 2c coins ever be scarce?